For the next sixteen weeks I shall be training for the third Brighton marathon, my twelfth, the race taking place on 15 April in my fifty-eight year. I am following one of the Runners World training programmes, designed to get me round in 4 hours and thirty minutes. This seems a reasonable ambition. 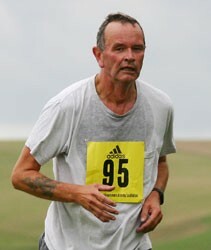 My marathon personal best was set at the Isle of Wight in 2006, a time of 4:10:40. Last year I finished Brighton in 4:46:52. There is some discrepancy between the training programme as it appears on the website, and the one downloaded to my Garmin. Thus, today's first run was either three miles (according to the website) or two (according to the downloaded version). In the event, I ran 2.42 miles. over the short Seaford Head route. My legs felt simultaneously tight and wobbly at first; I attribute this to Saturday's fast 5K. I have begun, therefore; sixteen weeks from now I shall be recovering after the race. I have one race planned during training, the Eastbourne half marathon on 4 March. Though my undergraduate career was a little less distinguished than the title of this post suggests, today, rather late in life, I achieved a double first, to wit I ran in the Brighton Park Run for the first time and ran a 5K for the first time. My time of 26:47 may therefore be considered a personal best. The Brighton Park Run, one of the oldest in the #parkrun movement, has managed 217 events without me. It was, I thought, high time I joined in. So I joined a group of runners in Hove Park on a cold Christmas Eve, adults, children, dogs, many of them decorated with traditional seasonal motifs. The cream of Brighton running society was here, as well as runners from neighbouring towns, such as Lewes's Sweder. We were marshalled into a huddle at the start, ready to run a route which consists of a half-circuit and two full circuits of the park. We set off and I watched Sweder ahead of me, making his way through the pack. I kept up a good pace for the first half lap as he made his way through the pack, and maintained it for the first full circumnavigation. When it came to the second, I realised that I had peaked too soon and I plodded round. For the last 500 metres, I opened the throttle for a fast finish, only to be passed by a small boy travelling at twice my speed. Enjoyable as the running was, even more so was the après-run; the park has a fine café, Sweder stood me an espresso and I enjoyed the company, especially that of a small and very pretty dog, Amber by name. I shall be back. Marathon training could not come a moment too soon. Readers of a nervous disposition, and innocent maidens, stop reading now, but the other morning I caught sight of my towel-draped self in the bathroom mirror and realised that my stomach has reached Socratean proportions. That simile may have come to me because I am reading Bettany Hughes's excellent The Hemlock Cup: Socrates, Athens and the Search for the Good Life. That's where the resemblance ends. I don't spend my days in the agora, asking random strangers about truth or virtue. If I did, I would probably be put in the cells of Seaford police station with some hemlock. So this morning I took myself out at about 6.30 for three miles. For the first section my legs were so weak that I wondered if I could complete this first quarter of a mile. I persevered and ran up Blatchington Hill, down to the sea, along the front and back to home. Storms have planed the steep shelves of Seaford beach into a gentle slope. I hope the same thing will happen to my stomach. Today I ran for the first time for a fortnight, and blogged about it for the first time for a month. Readers may dwell on how disgraceful this is in the comments, if you wish; I shan't argue.